The narrative and the central idea of a McCain presidency has not emerged during the campaign. 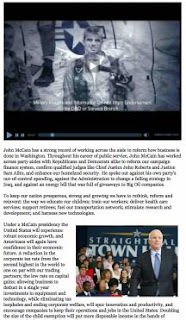 The presidential campaign of John McCain comes under the scrutiny of the New York Times Sunday Magazine this week in a long and revealing article by Robert Draper. The author uses the motif of the “shifting narrative” to explain some of the reasons why McCain’s campaign has never been able to take and hold the edge against that of Barak Obama. The central thesis of the article: A political campaign needs a “narrative” that allows it develop an image of the candidate.
. . . The selling of a presidential “narrative” the reigning buzz word of this election cycle has taken on outsize significance in an age in which a rush of visuals and catch words can cripple public images overnight. Mitt Romney, it is said, lost because he could not get his story straight. Hillary Clinton found her I’m-a-fighter leitmotif too late to save her candidacy. By contrast, the narrative of Barack Obama has seemed to converge harmonically with the shifting demographics and surging discontent of the electorate. It may well be, as his detractors suggest, that Obama is among the least-experienced presidential nominees in our nation’s history. But to voters starved for change, the 47-year-old biracial first-term Democratic senator clearly qualifies. That, in any event, is his story, and he has stuck to it. John McCain’s biography has been the stuff of legend for nearly a decade. And yet Schmidt (McCain’s chief campaign strategist) and his fellow strategists have had difficulty explaining how America will be better off for electing (as opposed to simply admiring) a stubborn patriot. In seeking to do so, the McCain campaign has changed its narrative over and over. Sometimes with McCain’s initial resistance but always with his eventual approval, Schmidt has proffered a candidate who is variously a fighter, a conciliator, an experienced leader and a shake-’em-up rebel. “The trick is that all of these are McCain,” Matt McDonald, a senior adviser, told me. But in constantly alternating among story lines in order to respond to changing events and to gain traction with voters, the “true character” of a once-crisply-defined political figure has become increasingly murky. The idea of the story is a powerful one for understanding a person or event. How that person got to where he or she is or what will happen when that person assumes power is important for a political campaign to establish. The campaign of George W. Bush was able to effectively obscure his historical narrative (how he got to where he is) with the idea of what would happen when he he was elected (he would be better than Gore or Kerry). McCain has an interesting, if not compelling, historical narrative. His years as a prisoner of war in North Vietnam cannot be matched by any presidential candidate since John F. Kennedy. Yet, as this article points out, he distained using it because at some point during his public life, he grew tired of it. He had repeated the story again and again, and he just didn’t want to revisit it again. His political operatives realized this and persuaded him to begin using it again during the general election campaign. The problem was that he didn’t do it effectively — probably because he didn’t really want to do it. It became an appendage onto every speech and even every paragraph — but not really an integral part of what he was saying. That left him with the narrative of what would happen when he was elected. McCain has not provided a simple, clear answer to that question.